What is the Dragon Sculpture in Mafia Wars? The Dragon Sculpture in Mafia Wars is part of the Sculptures Collection. It is one of the many collections in the Soldier Job Tier in New York. The Soldier Job Tier opens when players reach level 9. Other collections in the Soldier Tier include: Club Flush Collection, Poker Chips Collection, and the Boxing Collection. 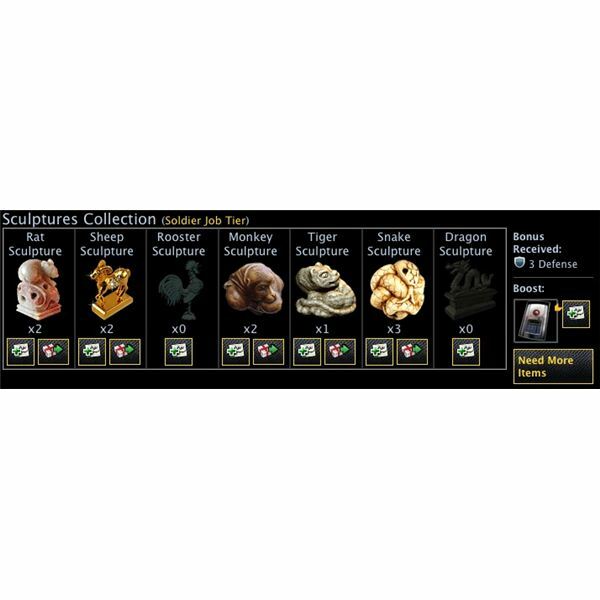 The items in the Sculpture Collection include: Rat Sculpture, Sheep Sculpture, Rooster Sculpture, Monkey Sculpture, Tiger Sculpture, Snake Sculpture and Dragon Sculpture. The Dragon Sculpture is the last and most difficult item to find in the loot drop. The Dragon Sculpture is a loot drop item from any and all jobs in the Soldier Tier. The jobs include: Destroy Enemy Mob Hideout, Kill a Protected Snitch, Bust a Made Man Out of Prison, Asian Museum Break-in, Fight a Haitian Gang, Clip the Irish Mob’s Local Enforcer, and Steal a Tanker Truck. The loot drops increase with each level mastery, so each time the jobs are mastered, the better the chance of the loot drop. As there are multiple collections to gather from the tier, it may take doing the jobs several times even after the jobs have been completely mastered in order to get all the items. Players who reach level 40 gain access to the Free Gift program which will allow other mafia members to give players any item in any collection. Players who are looking for specific items should add them to their wish list and post the wish list to their profiles and game feeds. Upper level players will have little to no need for these items and will gift the extras to lower level players in their family. Once players have collected one of all seven items in the collection, the collection can be valuted. When the collection is vaulted, players get a +3 defense skill bonus. This will help boost player stats for more strength in fighting and robbing throughout the game. If a player is able to collect multiple sets of the entire collection, then the collection can be re-vaulted for an additonal reward of an Alarm System which provides an additional 15 skill point bonus to robbing skill. These can be vaulted repeatedly to gain the boosts, but they are consumable and will run out. As there is an achievement for vaulting all the collections in the New York chapter Mafia Wars, it is important that all players collect each collection at least once. Re vaulting does not have to be a strong priority throughout the remainder of the game. While it will help boost robbing skill, there are other things in the game that offer greater benefit. Images in this article are copyright Zynga. They come from screenshots of my personal game account.